You hear it all the time: College isn’t for everyone. Yet, teens are feeling pressured to apply to universities even though, in their hearts, it’s not what they want to do. There is a viable option, and it can start while students are still in public school. It’s called vocational high school. And many school districts within the United States offer it—ask your own for more information if you’d like to enroll. Vocational high school is a non-traditional approach to education that’s been around for many years. You will not only focus on your academics, but part of your day will be dedicated to learning a trade, a skill that will last you far beyond high school. You’ll leave vocational school with your high school diploma, plus a license and certification in your chosen trade. In vocational high school, trades like plumbing, carpentry, cosmetology, information technology, and more are offered. They generally start in your junior year, but some as early as when you’re a sophomore, and go through your senior year. Part of your day is spent in your core classes, usually the morning. And the remaining half of your day is spent dedicated to learning the trade. Within your chosen trade track, all the information necessary for success will be presented to you as part of the curriculum. What Are The Benefits Of Vocational High School? Between 2000 and 2016, the price of college rose 75 percent. In 2017, 66.7 percent of all high school graduates in the United States went off to college; 40 percent of college students drop out. Meanwhile, 37 percent of college graduates work jobs that high school dropouts are in, making all the time and money spent on education highly questionable in their return on investment. Stats speak volumes, and in this instance it's saying people need to be aware of the alternatives, aside from the traditional path. Options that will allow people to take care of themselves and their families for the long haul. Increased high school graduation rates. Students still earn the high school graduation requirements. There are 16 occupational clusters, with different pathways included in each, that are available through career and technical education (CTE). Hands-on training, mixed with classroom learning give the students a well-rounded look into their potential careers. Within the pathways, students will learn the academic foundations, communications within their field, and problem solving and critical thinking, along with how to use the tools necessary, whether it’s a computer or a wrench. What you’ll leave with, once your schooling is completed, is a marketable skill that you can take with you into your future, whatever direction that may be. Early College high school programs: Imagine going to high school and knocking out two years of your college credits simultaneously. That’s the basic explanation for Early College high school programs. Students attend high school classes while also taking college courses. Some students graduate with not only their high school diploma but also their associate degree. And, the high school pays for those college courses, so it’s a win-win. School districts that have an early college usually partner with a local community college or university. They hold their high school classes on the college campus, which makes attending those college courses very convenient. Approximately 28 states offer some form of early college programs. There are many different models. Some may expect the students to live in college dorms, while others commute. Some start in 9th grade and begin the student recruitment process in middle school, while others are only open to juniors and seniors. Check with your local school district and find out what’s offered near you. Co-Op High School Programs: Some high schools offer a co-op program to their juniors and seniors. You’ll earn credits through an unpaid work program or internship. The schools that offer these types of programs do so at no charge to the student. No money is exchanged at all. 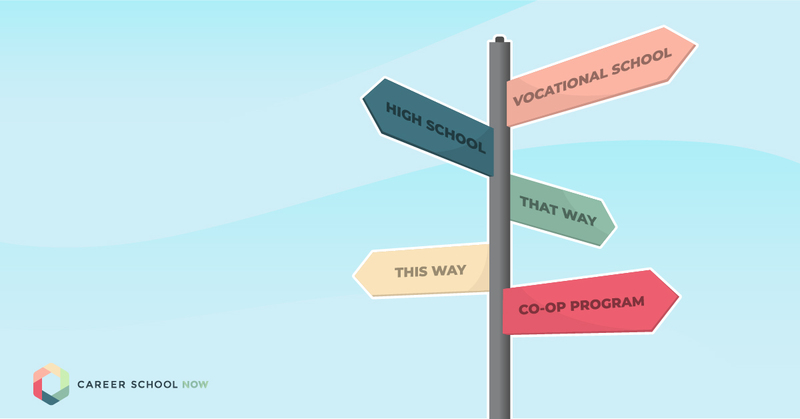 Co-op programs allow students to explore different careers while building their resume, soft skills, and work experience. From skilled trades to office jobs to medical, anything you can think of is offered. If you’re under the age of legally being able to work, you may have to get a work permit to participate. Many different local companies work with the school in offering co-op positions. Each have different requirements, from hours worked per week through maintaining a certain grade point average while involved with the co-op. Many co-op programs have students enrolled on certain days or hours, while the rest of that time is spent at their “job,” where practical work skills are being made. These students are able to go out into the workforce armed with the type of work experience necessary for success. College co-ops are different in many ways, particularly because the student also earns a paycheck.